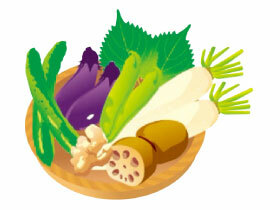 FUKUJINZUKE is a delicious variety of Japanese pickles made from seven different vegetables. In 2013, Japanese cuisine was registered with UNESCO as an item of intangible cultural heritage. 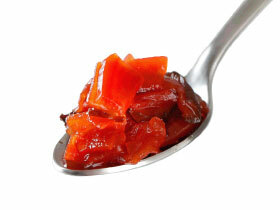 Japanese pickles are an important element of flavor in Japanese food, and have countless different varieties. Among these, FUKUJINZUKE is one of the most famous. FUKUJINZUKE is a non-fermented type of Japanese pickle, and is pickled with a sesame-flavored soy sauce, sugar, and a selection of seven chopped vegetables: radish, cucumber, eggplant, lotus root, ginger, perilla, and sword bean. It is also pickled with an original seasoning. Tokai Pickling takes the standard soy sauce and sugar ingredients and combines them with other seasoning to create a unique combination, in which the vegetables are pickled thoroughly to create a bold flavor with a touch of sweetness and richness. FUKUJINZUKE is a perfect match for different cuisines around the world. The salty taste of the soy sauce and the sweetness of the sugar soak into the vegetables to create an interweaving flavor that serves the role of a sauce, supporting the food of the world, no matter its country of origin. RADISH, SUGAR, SOYSAUCE(SOYBEANS, WHEAT, SALT), WATER, CUCUMBER, EGGPLANT, SALT, LOTUS ROOT, MONOSODIUM GLUTAMATE, VINEGAR, GINGER, PERILLA, SWORD BEAN, LACTIC ACID, SESAME, ACETIC ACID, RED PEPPAR, XANTHAN GUM, FD&C YELLOW NO.5(TARTRAZINE), FD&C YELLOW NO.6(SUNSET YELLOW FCF), FD&C RED NO.40(ALLURA RED AC), NATURAL FLAVOR.